I don't know about everybody else, but being trapped in a library, for a long weekend, sounds like the a dream come true. I'm pretty sure I'd be perfectly fine all alone in that library, with all of those books, but if you want to throw in a cute and broody boy, I'm good with that, too! I'm fairly new to Kasie West books, but I've had fun reading the few that I have, and this one was another fun one. I really liked that even though this was mostly a cute, fluffy read, it also had some real issues woven into the story. Autumn is a go-getter and a rule lover, but she also suffers from pretty serious anxiety. Being trapped anywhere isn't great for a person who suffers from anxiety, and it's made worse for Autumn because she only ran back into the library to use the restroom, so all of her stuff is in her friends trunk on the way to a party. Oh, and it's winter, so a big empty library is not exactly cozy. Enter the mysterious Dax, who lives in a foster home and for reasons he isn't really up to sharing, was planning to stay in the library for the weekend. Autumn doesn't know much about Dax, but considering they only have each other for the time they are stuck in there, they do get to know one another a little and start to realize maybe surface judgements don't really mean anything. I kind of thought, okay hoped, that the whole book would be them stuck in the library, but I'm glad we got to see Autumn and Dax outside of those walls. We got to see how their lives really were so different and it was no surprise they hadn't really known each other before, but it was also nice to see how their time trapped together played into their lives after. Thanks for the review. 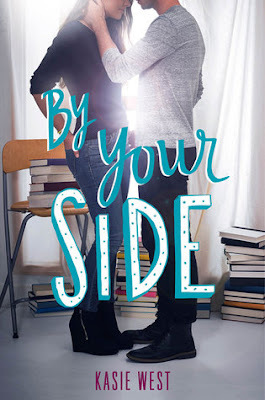 I have this book to read for review and I'm looking forward to reading it so I'm glad to see that it holds up to the other Kasie West books that I've enjoyed. P.S. I Like You was the first and only book I have read by Kasie West so far. I've been looking forward to this one since I saw it on Good Reads. I'm glad it's a fluffy read. I don't feel like I read a lot of those, but I really probably need to read a good fluffy one. I'm glad you liked it.